Engagebay is an integrates sales and marketing software that unifies all marketing tools into a single platform. Combined with rich CRM capabilities plus a very intuitive and user-friendly design, Engagebay gives companies the perfect solution for effective acquisition, engagement, and nurturing of website visitors, resulting in them being empowered to become paying customers. With Engagebay, all marketing tools are within reach, enabling users to quickly and efficiently reach out, attract, and engage website visitors and convert them into leads. The software’s wide range of sales and CRM capabilities help users nurture and accelerate the conversion of leads to actual customers. All these tools and features in one powerful, centralized platform. Engagebay is one of the most affordable integrated sales and marketing software in the market that boasts of a robust collection of capabilities including marketing automation, funnel management, lead management, CRM, and many others. It is a complete and dynamic platform yet it doesn’t carry a heavy price tag in contrast to other premier sales and marketing solutions with a similar feature set. If you are looking to automate your sales and marketing processes and enjoy loads of CRM tools, Engagebay has got you covered. Sales and marketing is a complicated facet of running a business but Engagebay makes it all easy and seamless. The software doesn’t require users to be extensively knowledgeable and technically sound in sales and marketing platforms. There is a slight learning curve but doesn’t present much of a challenge even to novice users. Engagebay has all the tools you need for you to effectively reach out to your existing and potential clients, grow your traffic, and increase your sales. Featuring a comprehensive set that includes lead management, funnel management, CRM, and more, Engagebay streamlines and accelerates all your workflows. From extending the r)each of your marketing campaigns to attracting traffic to cultivating customer relationships, you have everything you need in one, centralized place. What Problems Will EngageBay Solve? 1) EngageBay automates your marketing funnels and processes which is otherwise time-consuming if done manually. 2) It is one single software to acquire, engage and nurture leads to convert to customers. No multiple tool chaos. 3) One platform to do all marketing activities, saving time, costs, interoperability issues and manpower. Each business is different, and might need a particular type of Marketing Automation Software solution that will be designed for their company size, type of customers and employees and even specific industry they deal with. It's not wise to count on locating a perfect app that will work for each business regardless of their history is. It may be a good idea to read a few EngageBay reviews first and even then you should pay attention to what the service is intended to do for your company and your staff. Do you require a simple and intuitive app with only essential features? Will you really make use of the complex tools needed by pros and large enterprises? Are there any particular tools that are especially beneficial for the industry you operate in? If you ask yourself these questions it is going to be much easier to find a trustworthy solution that will fit your budget. How Much Does EngageBay Cost? We realize that when you make a decision to buy Marketing Automation Software it’s important not only to see how experts evaluate it in their reviews, but also to find out if the real people and companies that buy it are actually satisfied with the product. That’s why we’ve created our behavior-based Customer Satisfaction Algorithm™ that gathers customer reviews, comments and EngageBay reviews across a wide range of social media sites. The data is then presented in an easy to digest form showing how many people had positive and negative experience with EngageBay. With that information at hand you should be equipped to make an informed buying decision that you won’t regret. What are EngageBay pricing details? What integrations are available for EngageBay? Pros: Are use EngageBay for most things that include a sales pipeline, CRM, Appointment scheduling, and task management. It is amazing that one app can truly do as much as this application can do. What puts this application above many others has is the customer support they receive from the developers. First off they’re always releasing new features. These features are almost always stable. Second, the features really enhance the product themselves… They don’t just become loaded features that aren’t related like some other apps do. I’m excited to see you with this application can go, since it’s newer than most. Cons: The thing I like the least, is waiting for all of the new updates. Though, they’re so quick to release them that’s mostly my own issue. Pros: I signed up for EngageBay because I of their CRM features. It has so many promising features like tracking deals, contacts, list, email marketing and automation. 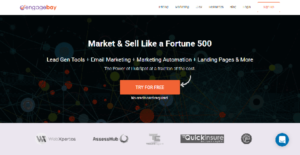 I like that I can manage all marketing in my business in one place + Integrate with Zapier. Cons: At the time of writing it looks as if the product is not polished enough. I am having glitches with sequences and email marketing automation, plus Zapier integration doesn't include deals yet (expected soon). Support is great answering all my question and fixing all the problems I encounter, but still it looks like some job is still missing. If you need more information about EngageBay or you simply have a question let us know what you need and we’ll forward your request directly to the vendor.